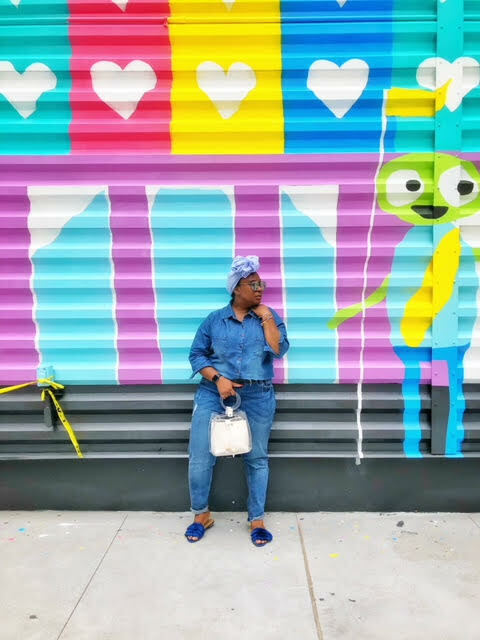 I guess I'll use this time (The Month of August) to explore my Boyfriend (NYC) and find some hidden gems that New York has to offer, like the murals over at WTC Westfield Mall. 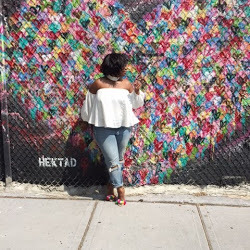 Last Summer I was on a quest to find the perfect mural/ street art in the city. It was so challenging walking around NYC in that 80+/90++ heat going on a duck hunt findings these murals (click here). This year I just so happened to be running some errands downtown when I came across this spray painted murals over at the new WTC (World Trade Center). While viewing the murals I saw a random guy taking pictures of the murals and decided to ask him to take my picture in front of one that matched my outfit nicely. He kindly took a few photos of me in front of the murals. Once he was done he asked my opinion on the murals, which I told him was: "Great, a very photo- worthy spot" for me, lol. Long story short he told me he was the artist who spray painted the murals around WTC. Look at me finding artists to take my pictures in front of their murals.